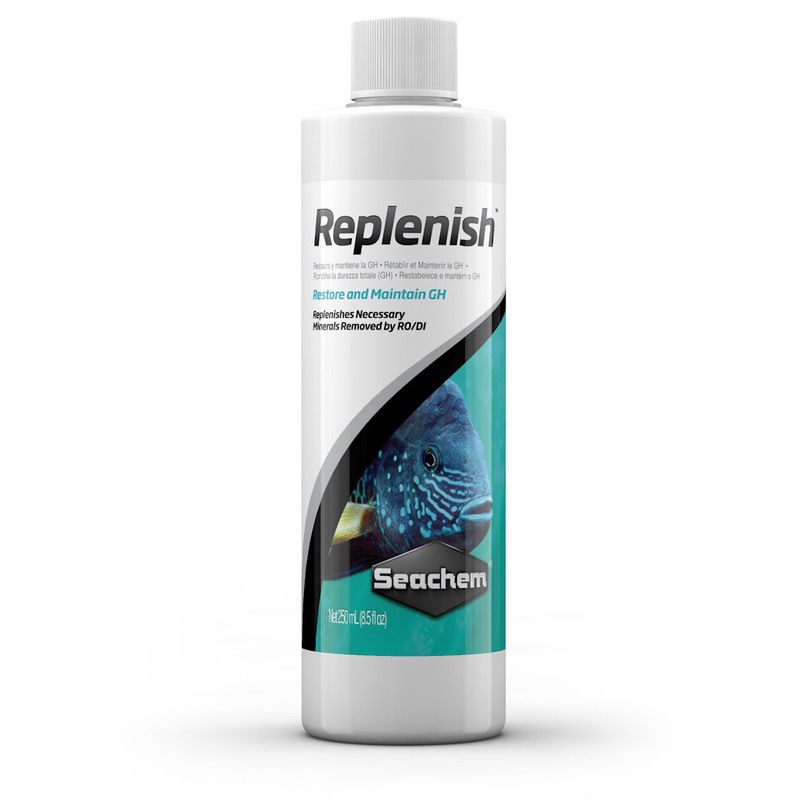 Replenish™ is a proprietary blend of salts designed to replenish physiologically relevant minerals that are removed by reverse osmosis or deionizing filtration. Replenish™ restores General Hardness (GH) using a balanced blend of both “soft” (sodium, potassium) and “hard” (calcium, magnesium) salts. Restoration of mineral content is essential since a complete lack of minerals will result in osmotic stress in those species whose osmoregulation systems are adapted to a mineralized environment. Severe osmotic stress can result in osmotic shock which will lead to rapid death. To restore GH in the planted aquarium, we recommend Equilibrium™. Should I use Replenish™ in my live-planted aquarium for restoring mineral content and increasing GH? Osmotic stress and shock occurs when fish are kept in water with inadequate mineral levels (too high or too low). Osmotic stress affects more seriously fish whose natural habitat is rich in minerals and who are kept in an aquarium with a low mineral level, as osmotic gradients (difference) between the internal fluids of the fish and its surrounding environment (water) increase. Such fish have a less effective osmoregulation than those who are physiologically adapted to water with a low mineral level. That is why they are not able to cope with overloading of osmoregulation. Osmotic shock can be a result of a breakdown in osmoregulation due to inappropriate chemical composition of the water. It can also be caused by increased permeability of the skin resulting from a disease or trauma. Osmoregulation enables fish to maintain the proper balance of salt and water in the body, which is necessary to create optimal conditions for various physiological and biochemical processes. In all fish species osmoregulation developed in a way that enabled them to maintain the proper balance of salt and water in the water with chemical composition found in their natural habitat. If osmoregulation is disturbed due to adverse conditions (osmotic stress) or a sudden change in the chemical composition of water (osmotic shock), fish might not be able to physiologically cope with it. Chronic osmotic stress can eventually result in fish’s death and osmotic shock can cause death very quickly.